The new Tuning & Dyno views available in TunerStudio MS Ultra allow you to build your own views with pretty much any set of gauges and settings you want on a single tab. The Idea is you can build a tab for specific types of tuning or tuning activities. Build as many tabs as you wish with a specific purpose for each view. - Settings Panel - This allows you to put any settings panel from any of the dialogs you would normally use through the menu buttons. - Tuning Table - Similar to a Settings Panel, except this only allows Tables and Curve graphs. This is preferred for tables as it will allow you to stretch or shrink the table to the size you need with no scroll bars like the Settings Panel would have if the panel doesn't fit in the set space. - Gauge Cluster - A standard Gauge Cluster as would be found on the front tab, but here you can add multiple and set each to just a small region. - Table Cross Cell Cross Hair - By assigning this widget to a table, it will show how centered you are on a particular cell while tuning. - Burn Button - Well it's a Burn Button to persist to flash. If you create or edit a view, it is all saved to a single .tuneView file, so can easily be shared or moved to another project or computer. For those that have been trying out the beta and the Ultra trial, you have seen the new Tuning & Dyno Views. There are some basic default Tuning Views, but I would like to get some more together before the release. MS3 probably has the best set now, so below are screen shots of the current set. Before the release, we will adapt the full default set to any of the firmwares that it is applicable and makes sense. Here are some sample MS3 Tuning Views, with more coming. 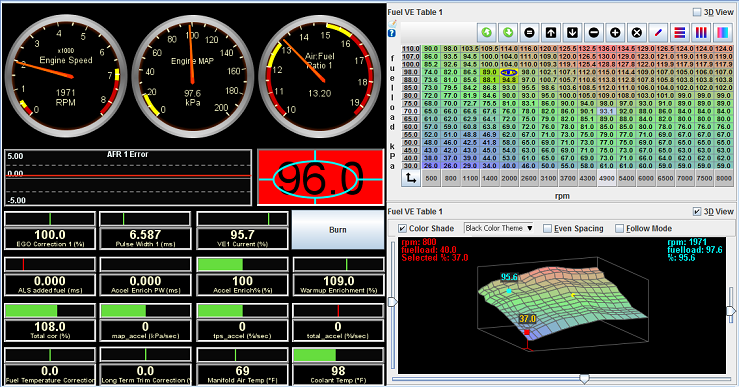 View specialize for Dyno pulls with a large AFR readout, Main Fuel Table, a table cell targeting widget and all the Gauges and readouts you would want for a dyno session. Some additional thought was put in here to insure these gauges will blair red at you in situations where say the coolant temperature goes high. Another view that provides both a 2d and 3d view of the main fuel table with a Cell Target and gauge cluster. 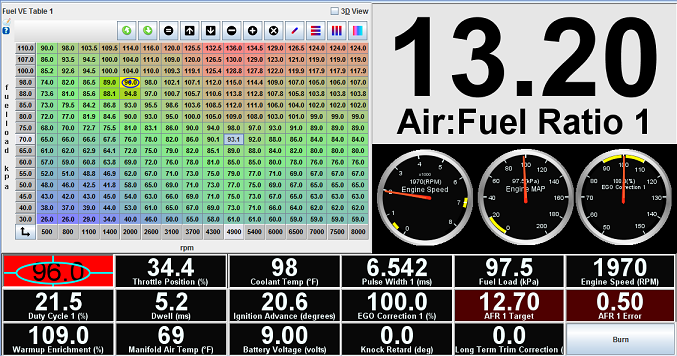 View with AE settings and gauge cluster on a single view. There are really no limits to what views you can build!